Comfortable Material: Our Strapless bandeau bras are made of 96% nylon and 4% spandex. Constructed with seamless and soft material, the top effortlessly creates the perfect comfortable fit that allows a large range of active movements. Diverse Dimension: Whichever size you can meet your favorable. Size S Fit: 30A/30B/30C/32A/32B ,Size M Fit: 30D/32B/32C/32D/34A/34B, Size L Fit: 32DD/32DDD/34B/34C/34D/34DD/36A/36B , Size XL Fit: 34DD/34DDD/36B/36C/36D/38A/38B/38C/38D/40A. Please be careful to choose size. 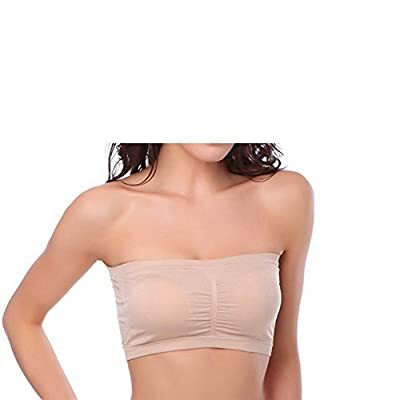 Wide Application: This unique basic tube top is a great multi-purpose bra- whether it's for an exercise or used as a casual strapless bra for daily wear.The ribbed band that hugs the body provides a secure, well fitted look. 100% Breathable: Seamless, Side Widening, Super Supporting and Easy to Size with removable Molded Foam cups. 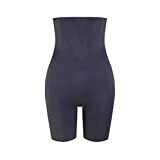 The secured bands and compression prevents the top from slipping off to complete the ideal distraction-less workout. With complete coverage, this bandeau top will be good to go when paired with workout shorts for a light exercise! Quality guarantee: As an alternative, this bra is also great when worn underneath strapless tops. We assure you its high quality, but please note that the support ability of bras is different from each person, thus the wearing effect is different. We'll refund you or send you a replacement, if there are any quality issue.